Hairloss ,Alopecia, is a major problem affecting countless people worldwide. Case in point, in the US alone, as many as 35 million men and 21 million women are experiencing hair loss. Alopecia occurs when the quantity of hair lost can’t be compensated by the rate of hair regrowth. Different kinds of hair loss manifest in various ways but that doesn’t mean that a few stray hairs on your hairbrush directly translates to a crisis. As a matter of fact, we lose up to 100 hairs on a daily basis but they are mostly replaced. However, if you spot numerous bald patches or lots of thinning hair, then you may be experiencing significant hairloss. Alopecia can be caused by many factors ranging from inherent genetics to environmental causes. Androgenetic alopecia, which is the main form of hair loss, owes its roots to predetermined genetic factors and the overall aging process. Both men and women are affected leading to male or female-pattern baldness. Interestingly, the idea of hair loss carries numerous connotations depending on whether it appears in men or women. Hair loss in men is mostly viewed as an unfortunate but expected consequence of age while in women, hair loss is much more devastating. 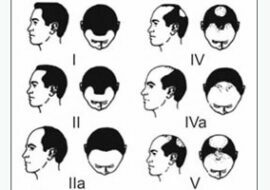 This shows just how much hair loss in men and women differs in prevalence and severity. Male pattern baldness is universally accepted as the most common type of hair loss and for good reason; it accounts for more than 95% of hair loss in men. 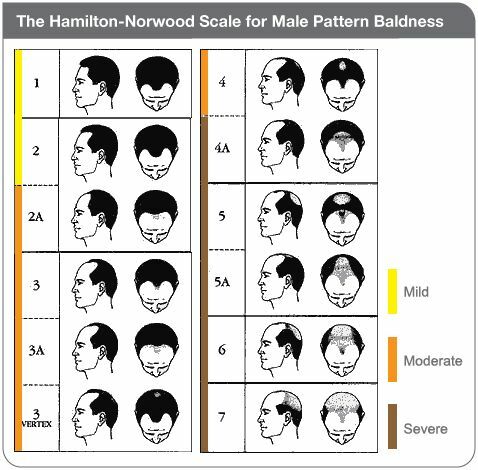 By the age of 60, 65% of men already have noticeable hair loss largely due to male pattern baldness. 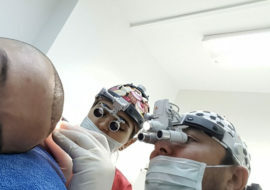 It usually starts in the late twenties and follows the pattern of a receding hairline together with thinning of hair located at the crown and temple. For some, this may gradually progress to complete baldness but it’s not common. 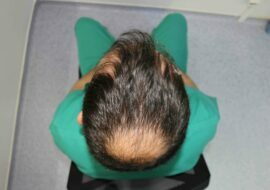 This pattern of hair loss is hereditary with affected individuals inheriting hair follicles with a genetic sensitivity to the male hormone dihydrotestosterone (DHT). Hair follicles sensitive to DHT are miniaturised and have shortened life spans, eventually leading to baldness. Other than androgenetic alopecia, there could be many other causes of hair loss. These are the causes of the many other types of alopecia and they include serious infections, use of chemotherapy, adverse reactions to drugs, and even extreme stress. 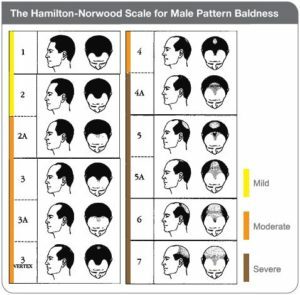 However, the probability of male hair loss being due to factors other than hereditary androgenetic alopecia is quite low. As is the case with male hair loss, the most common cause of hairloss in women is androgenetic alopecia. 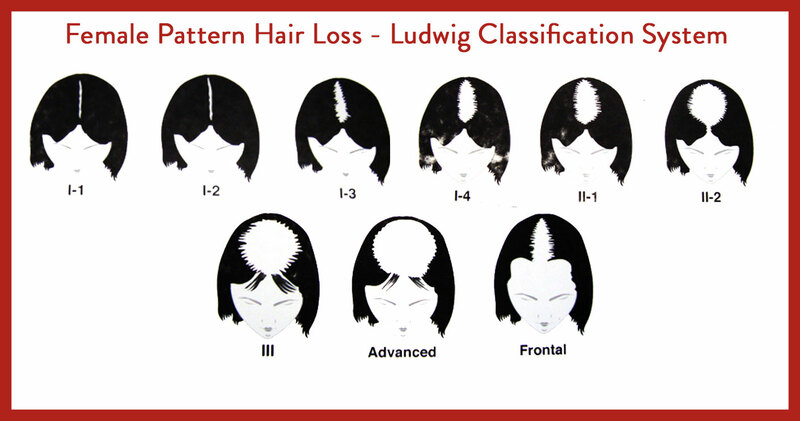 The pattern of hair loss is this condition is different from the one seen in males. Hair loss tends to be more diffuse with less hair loss seen on the crown and hairline than in males. Women usually notice some thinning in the top third to one half of the scalp. The hair loss is gradual and it takes a many years before any hairloss is noticed. Female pattern baldness is hereditary and is also due to the action of DHT on sensitive hair follicles. The hair follicles become more sensitive to the effect of DHT even if there are normal low levels of male hormones. Incidentally, the hair loss is more pronounced during menopause (after monthly periods stop) when there are less female hormones circulating. This gives an edge to the minute amounts of male hormones normally present in women. Other than androgenetic alopecia, there are other hair loss conditions quite common in women. The most notable is telogen effluvium which occurs when the body goes through something traumatic and stressful (childbirth, extreme malnutrition etc.). Fortunately, the hair regrows once the body gets back into rhythm.